It's amazing how much stuff you accumulate through the years. With my moving in two weeks, I'm trimming non-essentials from my life. (hence the garage sale.) While going through my makeup, I discovered some duplicates, the first of which is liners. There was a time I wouldn't step out of the house without eye liner. Ahhh, how that's changed. For someone who uses liner maybe twice a year, I sure do have a lot! Here are brief comparisons, one each for blacks and browns. 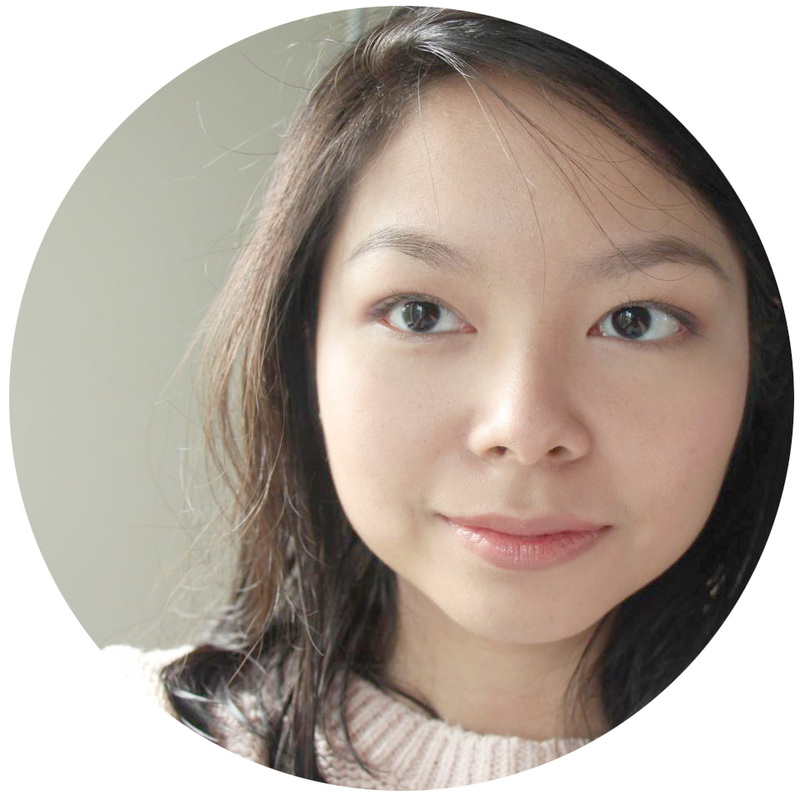 Black liners are great for intense definition and graphic eyes. I like using these at night or for events. 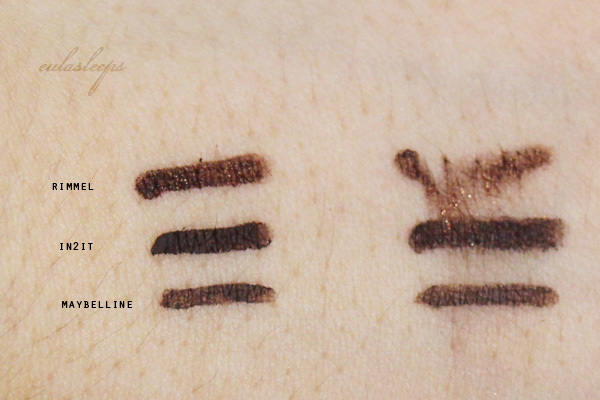 Maybelline Eye Studio 2-in-1 Shadow Liner - My first eyeliner! I actually tried to wing it out with this. Unsuccessfully, because as with most pencil liners, it's hard to get a fine line. It smudges like no one's business, as you can see in the swatch above. It was taken 5 minutes after drawing. I suspect it would do well as a pencil shadow, or a heavy smokey eye, but you'd have to set it and I never used it as such. In2It Waterproof Gel Liner - I'm a BIG fan of these pencil gel liners. 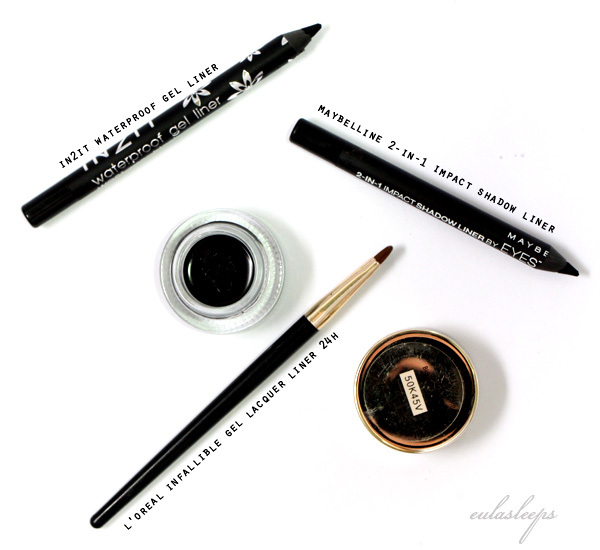 All the intensity and longevity of a gel liner, in pencil form! You can see how opaquely black it is, and once it sets it doesn't budge. It takes a proper eye makeup remover at the end of the day, and often I can't get it all off. In this heat the "lead" gets really soft, so sometimes I actually take a liner brush to it and use that to apply it on my lids. K-Palette 24 Hr Real Lasting Eyeliner (not pictured) - My favorite for ease of use and really thin lines. Once the liquid sets, it doesn't budge! It does start to flake off around the 12-hour mark. Easily removed with micellar makeup remover or cleansing oil. I used mine up a long time ago because I used it every day! I love brown liners for day wear. They're a subtle and natural way to define the eye. Rimmel ScandalEyes Kohl Kajal Liner - An impulse buy. This is on the red-brown side of the spectrum and has a bit of golden shimmer for added brightness. 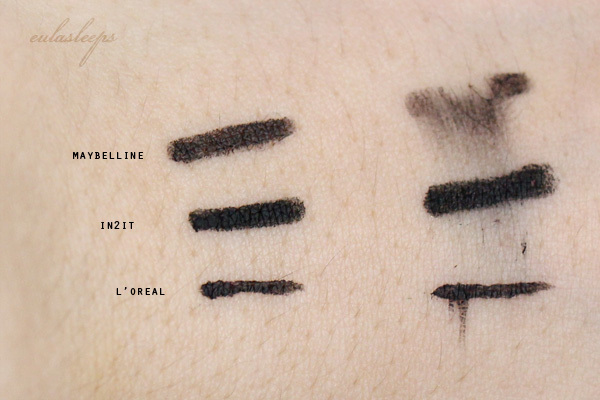 Being a kohl liner, it's meant for smudging, as you can see in the swatch above. A good basic liner. In2It Waterproof Gel Liner - Everything about the black liner holds true for this dark brown liner. These gel liners comes in many more colors, like gold and navy. Love! 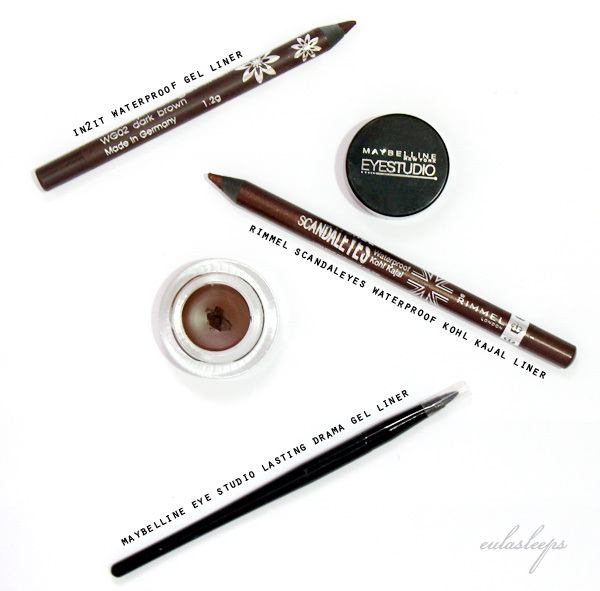 Maybelline Eye Studio Lasting Drama Gel Liner - A lighter brown potted gel liner that has also been compared to Bobbi Brown's. Pretty long-wearing, but takes a few strokes to make an opaque line. I like L'Oreal's formula better. K-Palette 24 Hr Real Lasting Eyeliner (not pictured) - Has the same properties as the black liner. I used up two of these before I found that I could define my eye faster and more easily with eyeshadow. Is of similar intensity to the Maybelline gel liner. Really great for a subtle day look!